Extensive research has provided a widely accepted explanation for the irrational behavior often observed in financial markets. The question that remains is what if anything can we do about it? Precious little of any substance has been offered for addressing these issues and it is often wrongly assumed that simply knowing about these problems will fix them. Before continuing with this part of the discourse, I would like to make one point very clear. While trading psychology appears to be important in determining successful outcomes it is not of itself a total solution. You first need a reasonable statistical advantage, commonly called an edge. Once you have an edge, you then need to adhere to a workable money and risk management policy to maximise your returns and minimise your risks, consistent with your edge and your own personal risk tolerance. These two requirements are essential to long term success; once you have them, good psychological skills are likely to significantly improve your decision making and save you from the many forms of self-destructive behavior that can quickly turn profits into losses. A commonly offered piece of advice is that it is necessary to trade or invest without emotion. Even if this feat was possible it misses the key issue by a mile. Good poker players learn to hide, disguise or control their body language , which could otherwise give their opponents insight into the strength or weakness of their hand. Traders and investors on the other hand normally operate from behind a computer terminal. The market doesn’t know or give a damn about your body language or your emotional expression. What you need to do is manage your market behavior which boils down to the timing and execution of a few keystrokes on your computer trading platform. While emotions play an important part in trading decisions they can’t simply be ignored or overcome by will power. 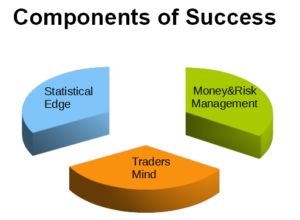 What is required is substantial neural restructuring and skill development in the parts of our brain used to make trading decisions. There is little point in trying to change or get rid of the original survival based patterns. They are too well entrenched to have any chance of replacement. What we attempt to do is grow new cognitive networks that can specifically assist us to manage ourselves and make better decisions in the trading/investment process. The best way to go about doing this is something of an open question. There are a number of interesting possibilities that, together with some of my trading colleagues, we are currently exploring. In due course I hope to share some of these ideas on this blog. In the meantime, here are some brief notes on how we are endeavoring to go about it. Obviously we first need to understand what we are dealing with. As already said, there is a lot of information readily available, including Kahneman’s own best-selling book, so a bit of reading is first in order. Writing things down helps bring a subject more into focus. In the past I simply recorded my behavioral self-observations in the footnotes of my daily trading journal. This journal is a sequential record of trading data that is mostly used for monitoring and developing my trading edge. I recently decided that developing one’s trading psychology was a much more circular activity whereby one goes over the same ground again and again endeavoring to make small incremental changes or improvements. To this end I now use a completely separate hand written journal devoted to this task that I can more readily look back into, reflect upon and periodically update. One thing we need to guard against is “skipping over” the issue. This is simply a form of rationalisation that we humans use as a defense to avoid the often uncomfortable process of change. We all find it easy to accept that everybody else behaves irrationally except ourselves. Another common fallacy is that we can control or overcome irrational behavior with will power. We can use will power but we first need to use it to stop ourselves engaging in this self-deluded thinking and learn to just observe and accept these behaviors as part of our normal and evolving self. These observations should of course be recorded in our journal. It is also important to learn to not beat yourself up, particularly when poor trading decisions, influenced by cognitive biases lead to losses. Beating yourself up strengthens existing behaviors. It doesn’t reduce it. We simply need to practice accepting, observing and recording these observations in our journals. The above steps seem to provide a good starting point but we also need an effective process to bring about and maintain the desired changes. In recent years a significant amount of research into effective change has been carried out in areas like education, physical and mental health. Some of these may be able to be adapted for trader training purposes. We need to exercise some caution however. There are a lot of wacky ideas out there and some of them find their way into popular articles and self-help books. They often sound interesting but have little substance and may finish up just wasting time and destroying motivation. The research we need to focus on is the sort that has been tested in a number of properly managed trials with significantly positive outcomes. There is overwhelming empirical evidence to support the theory that price movements in large liquid markets is driven by human beings interacting with each other in the hope of gaining a financial advantage. The cosmic joke is that all humans are heavily handicapped in this endeavour by their ancient hereditary beliefs that we now call cognitive biases. There are also other lesser known and understood problems like the inability to make good statistically based judgements under conditions of uncertainty. Your long term, overall success as a trader or investor probably depends significantly on how skillful you become at handling these biases and other limitations inherent in “normal” thinking. Thank you for the good write up. It is an amusing account. the way, how could we communicate?